Home » News » Award Winning Scrum Product! BCS & Computing UK IT Industry Awards 2014 Winner! 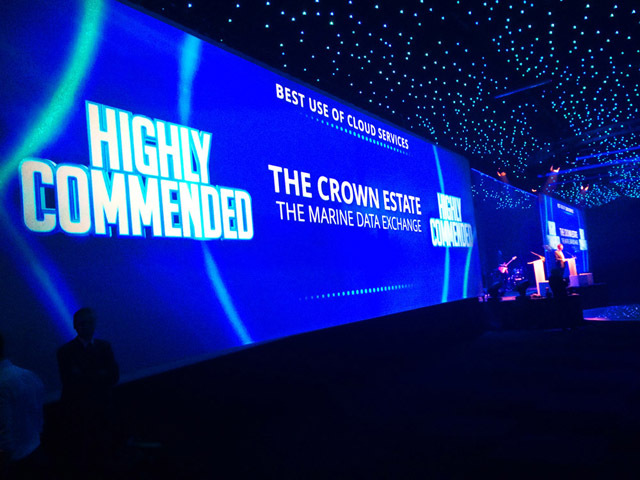 As Solutions Architect and Scrum Master for The Crown Estate’s Renewable Energy project, Marine Data Exchange (MDE), I am truly honoured to have been nominated by the team to collect one of the highest IT industry accolades last night, on behalf of The Crown Estate. I am pleased to announce that Marine Data Exchange won the Project Excellence Award for Best Not for Profit IT Project at the British Computer Society & Computing UK IT Industry Awards 2014. To round off the evening, MDE also achieved won a Highly Commended Award for Best Use of Cloud Services Award. MDE was a pioneering and highly complex Big Data project, treading technical ground that had not been trodden before, by using Microsoft SharePoint to store and manage up to 1PB (1,000 terabytes) of marine survey reports and data. Portions of this data were then made available, in the cloud, to businesses and other interested parties. Looking for the most efficient and cost-effective way to deliver MDE, Carl Adamson sought direct advice Jeff Sutherland, the co-creator of Scrum, the World’s leading Agile process framework. Although initially impressed with the “beautifully crafted”, Waterfall project plan, and “enough Gantt charts to decorate the whole office”, Jeff highlighted the typical Waterfall pitfalls that Scrum practitioners are all too familiar with and demonstrated how Scrum was the only way to successfully deliver MDE. Jeff was right. Thank you Jeff! MDE truly was an Agile team effort, with everyone in the cross-functional Scrum Team playing a vitally important role, not least the Product Owner, Pete Edmonds, who had the most challenging role in articulating the complex business requirements to the rest of the Scrum Team! The Crown Estate – UK IT Awards 2014 – Winner! If there ever was an Agile text book example of how people can be brought together, overcoming uncharted technical challenges, timescale restrictions, budget limitations and differing views, to deliver a complex, quality product that is considered by the industry as an example of excellence, then look no further than MDE. Well done, The Crown Estate! Next:A Hat Trick for Cody Technology Park!